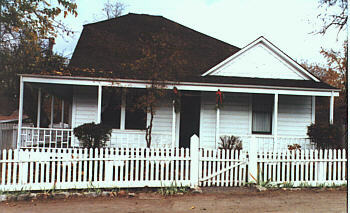 This building is often refered to as the Biddle-Bacon-Morgan-Hale- Vassollo-Sartoris-Martinez- Gawley House. Ok, so "often" may be a bit too strong. But, retired Ranger Sherrin Grout has been known to use such terms when describing this frequently sold building. It was purchased by the state in 1991. It is the intention of the State Parks to use this structure as an authentic backdrop for living history programs. However, the continual decrease in financial support for the parks has so far made that goal unattainable.